Over the years we have grown and adapted our program as our learning has matured. We are always looking for new and better ways to teach your children, keeping their best interest at heart. S tarting in January, we embarked on a new journey. In our Swim and Stroke School programs, we began experimenting with the idea of running semi-private (2 children) lessons for 15 minutes vs groups of 4 children for 30 minutes. I made this decision after experiencing a day with lots of absences and teaching one or two students in each class. The students and I not only enjoyed the teaching environment more, but the students seemed to be more engaged and receptive to instruction. They focused better. I was more effective as a coach as I did not have to spend time ‘wrangling’ four students. The pool area was more calm and quiet, lending itself to a better teaching environment. The children were able to maintain focus the entire time. The hands-on time increased per child. Children practiced more and learned concepts faster due to increased repetition per lesson. The coach got to know the children on a more intimate level. They had more time to accommodate each child’s needs. The children had less downtime waiting and more swim time. They were always moving from either the coach or their starting point, resulting in less disruption/down time in class. To further explore our results, we went out looking for research as to reasons why the semi-private format works as well as it does. Researchers have discovered that as students listen and process new information, their brains expend energy. On average, they remain attentive for about 10 -18 minutes. After which time, they fatigue, become overloaded and forget much of the information they have taken in. If there are distractions such as noise and increased activity, their attention span decreases further. In fact, as lesson time increases, students often exhibit anxiety as they try to hold on to all of the information. In addition, students recall more information when they attend 2 shorter lessons at different times rather than 1 longer lesson. The results of our 3-month trial supported these learning studies. Our semi-private lessons naturally incorporate this research. Children are able to relax and progress more due to the enhanced learning environment. We incorporate ‘strategic play’ into our lessons as much as possible. However, we feel ‘free play’ is also a very important aspect of a child’s enhanced comfort level and learning experience in the water. To create an opportunity for increased play and socialization time in the water, we have opened our facility for Family Open Swims exclusive to FLOW clientele. Family Open Swims are held two days a month on a Friday evening and Saturday afternoon. This provides the best of both worlds…play time, when it’s time to play, and learning time, when it’s time to learn, thus creating the best possible learning scenario for the children. Since FLOW is celebrating 14 years, we have decided to break down barriers and start our High School years on the cutting edge of innovation. 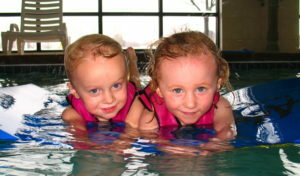 We are officially adopting the Semi-Private Format for all our Swim School and Stroke School classes. We are excited and welcome the benefits the new change will bring to the entire FLOW community.